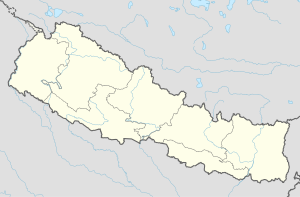 Dughla is a glacial lake, small hamlet and mountain pass in Solukhumbu District in the Himalayas of Nepal, to the south of Khumbu Glacier. The settlement, consisting of several huts, is located at an elevation of 4620 metres (15,160 ft), making it one of the highest settlements in the world, but likely not permanently inhabited all year around as it is essentially a collection of huts catering to hikers. Gokyo to the northwest is a little higher in elevation than Dughla. The village lies in an elevated position above and to the northeast of the lake, obscured from views of the lake by a rocky precipice. The village is best viewed on Google Earth at 27°55′27″N 86°48′18″E﻿ / ﻿27.92417°N 86.80500°E﻿ / 27.92417; 86.80500. ^ Bezruchka, Stephen (1985). A guide to trekking in Nepal. Mountaineers. p. 218. ISBN 978-0-89886-094-8. Retrieved 13 May 2012.